I am desperately trying to help another kitten in need. Someone at work found a stray kitten on their doorstep and he has had a trauma to one of his eyes and it needs to be removed. I am willing to adopt him and pay for shots and routine care, but the surgery required to remove/repair his eye is estimated at $1000. Can you recommend any reputable veterinarian's that work at cost so we can get him the care he needs? Currently, the little guy is boarded at an animal hospital until the money can be raised. The woman that found him is also searching for a temporary foster home so if know of anyone, please contact me. (I will take him after his shots and surgery (so my current cats are protected) if he doesn't find another permanent home). I've been told he tested negative for Feline Leukemia and HIV. Any advice you may have is greatly appreciated. Please contact Dr. James Clinton of the Animal Eye Clinic located on Rt. 204 541, Medford, NJ 08055, phone number 609-654-0304. Ask to speak to him directly. Tell him the story and ask him if there is anyway he could perform the surgery at a discount. 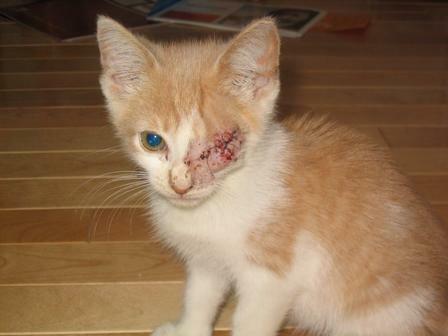 He did surgery for one of my rescue kitties for a very reasonalbe price. He is an awesome veterinary ophthalmologist. In the meantime, I will send out a crosspost to other rescue groups to see if anyone could help donate some money towards the little kittens surgery. Please let me know what happens and if you receive the help you need. The appointment is for tomorrow at 12:45 should anyone want information directly from the doctor. I'll let the doctor know that donations may be sent directly to the office and will also final up to let everyone know what the actual cost will be as well as to keep everyone informed as to how much was donated. I want to sincerely thank everyone for caring about the little guy. I'm overwhelmed by the amount of responses we've had and I know the little kitten is also grateful for his life. Did everyone get the online photo album? If I missed anyone please let me know or forward. I picked the kitten up last night. I then drove to Pam's (Saved Whiskers) so she could take a quick look at him. He is shy and cautious at first (sat at the back of the carrier) but after a few minutes, he felt more comfortable and got closer to the door and us. He really is a sweet kitten with a great disposition. He purrs, rubs against your legs and even likes to play despite his condition. He is eating well too. Today he saw Dr Clinton. 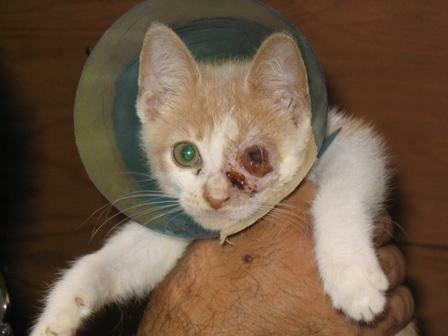 The eye did have to be removed and he will require some after care but it shouldn't be too drastic. I missed Dr Clinton's phone call but he confirmed that the surgery was complete and that the kitty is doing well. I should be able to pick him up tomorrow morning. Other than the eye situation, he has fleas and a distended abdomen which i think translates into worms. The doctor said that he had some sort of slit/incision and fluids started to leak out, including the iris. That is why his eye is essentially "hanging out" of the orbit. The doctor thought it has been that way for a long time. Since he was a stray, noone knows how this may have happened. Luckily, there shouldn't be any damage to his good eye. So in a couple of weeks, he should be good as new! I do not have a diagnosis or written description as of now, but hope to get something either tomorrow or by the time the kitten goes back for the aftercare and to remove the stitches. Please also send me a note if you have any ideas for the little guy's name. Right now we are just calling him baby boy so he needs a name. And lastly, if anyone wants to visit him, let me know so we can make arrangements for you to stop by. IF ANYONE WAS INADVERTENTLY MISSED, PLEASE PASS THIS MESSAGE ALONG. He's home!!!!!! And he is still purring. He loves to be held and loved. Dr Clinton said to worry if he didn't eat by Monday evening but he already ate a whole can of wet food. He's a trooper. Now I am off to give him a bath and finish combing out the fleas. His next appt is Oct 6 for a check-up and to remove the stitches. There is only 1 name suggestion so far....Blinker. Are there any others? $65 for the initial exam. $40 for the operating room. $18 for the overnight hospitalization. $25 for blood, fluid, oxygen. Total for the surgery is $353.00 As soon as my husband gets home, I'll have him scan the bill so you all can see it. And I would highly recommend Dr Clinton if anyone needs a VMD. He doesn't typically do surgery on Saturday and I think he made an exception for the little guy. He really cares about our animals...even mentioned that the kitten was purring late last night. So he either stayed late with him or went back sometime last night to check on him.